Outlook: Bucaro is one of the country's top high school players and helps make the Patriots a favorite to appear in the county final. Help offensively comes from McCulloch. Outlook: In his first year starting, Giacalone was named Suffolk Goalie of the Year. Avanzato, who is verbally committed to Maryland, could have a breakout season. Outlook: Henningsen is a faceoff ace. The possessions often lead to goals from Sutherland, who had 22 goals and 25 assists last year and is headed to Michigan. Outlook: The senior-heavy team could make the playoffs again behind Licata, who was named All-County. 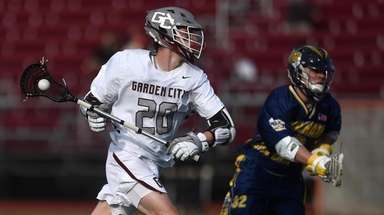 Outlook: Snyder, who is committed to Maryland, is a versatile player who won 77 percent of faceoffs he took and also had 19 goals and 10 assists last year. Outlook: Goal is to make the playoffs behind a strong defensive unit that returned most of its starters, including Barry. 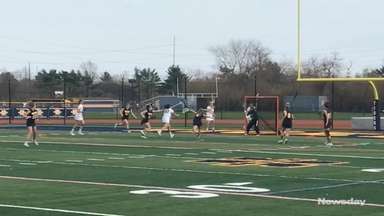 Outlook: Steiger led the team in scoring with 32 goals and 12 assists. Dan Byrnes will be counted on to defend opposing teams' top scorers. Outlook: Ilchuk is a threat with both hands who verbally committed to Lehigh. Glynn is an up-and-coming solid player who could have a breakout season, much like a few others on this team. Outlook: Aguirre is a steady presence in the net and Yodice provides decent experience for the rebuilding team. Outlook: Oehl and Ponzio form a strong attack while Pinto provides leadership in the back. Outlook: Alban had 41 goals and 21 assists last season. Murphy could have a big season while running the offense. Outlook: The team will rely heavily on its senior leadership. Sivon made 88 saves and had three games with double-figure saves last season. Outlook: Harned could have a big year on offense as the team looks to get back to a winning season. 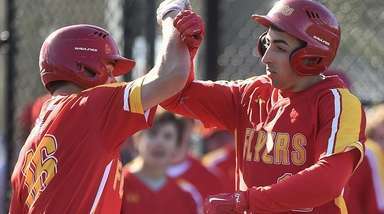 Outlook:Willetts, Arceri and Daniggelis return after receiving All-Long Island honors and leading the Bulls to the Suffolk Class A title. Dan Rooney could also have another big season for the team many say is LI's best. Outlook: Caddigan will look to continue his growth as a viable scorer after notching 18 goals as a freshman. Varello, who is committed to Syracuse, excels at the faceoff X. Outlook: The attack unit could be one of the best on Long Island. Mule had 33 goals and 31 assists as a freshman. Top-notch defender Malcolm Flynn could return later in season after recovering from an injury. Outlook: Many coaches believe this group can make a deep playoff run behind DiPietro, a four-year starter who is committed to Syracuse. Outlook: Carrara is a three-year starter who is committed to Maryland. Coleman, who is committed to Hofstra, enters his second season as a starter. Team could surprise and make deep playoff run. Outlook: Wright led the team with 60 points. Midfielder Mordecai Burt could have a breakout season. Outlook: Brennan solidified himself as one of the county's steadiest between the pipes. Team could make deep postseason run. Outlook: A very strong defensive team led by Ponce, who saved 58 percent of shots against him, Craig said. Outlook: Hart is an all-around talent. McCarthy is expected to lead the team offensively, Costello said. The goal is to make the playoffs. Outlook: An explosive offensive group led by Kolano (28 goals) and Satterley (25 goals) will look to take the next step and qualify for the playoffs under the new coach. Outlook: Reid could have a major impact after transferring back from St. John the Baptist. Schaeffer, a talented shooter, will guide the attack. Outlook: Sconone is a strong stopper who is emerging as one of Long Island's best. Outlook: Bonser is a three-year starter on varsity and a second-year captain. Outlook: Buonaiuto, who racked up 42 goals last season, leads the potent attack, which also could get a lift from faceoff specialist Christian Stalter. The perennial contender could be in the mix for another county title. Outlook: The defending county champions feature a strong offense led by Borja, who scored 40 goals. Sullivan is a versatile player who won an impressive 69 percent of draws at the faceoff X. Outlook: Bray (42 goals) and Hughes (26 goals) could lead the team to the county final under first-year head coach Taylor. Outlook: Goal is to make the playoffs after moving from Class A. With good mix of veterans and young talent, the attack unit could score plenty. Outlook: A playoff spot is possible for the team that returns six starters. Outlook: Possessing the ball will be key for the group that features several multisport athletes. Rao won 68 percent of draws, according to Scheidel. Outlook: Moreta emerged as a playmaker last season, totaling 21 goals and 34 assists. Dean helped win some games by using his ability to stop shots from close range. A playoff spot is possible. Outlook: Moved to Class B after reaching the county final in Class C for five straight seasons. Lombardi and Johnson each racked up more than 60 ground balls last season. Outlook: Selts and Coan provide the Golden Flashes with a tough, athletic and unselfish duo at midfield. Team could be poised for another good season. Outlook: The defense is one of the best in the league. Faceoff specialist Zack Deutsch will play a vital role. 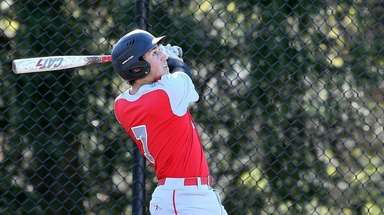 Outlook: Mattiace is a four-year starter and two-time All-County player who is a vocal leader. Moya and Reda are young, but both are expected to be big contributors, Travis said. Outlook: O'Neil excelled last year with 23 goals and nine assists, and Toole racked up 160 saves. With another year of experience, team could improve. Outlook: Clemente will lead the offense after scoring 15 goals last season. Sophomore Hunter Mason could make an impact defensively. Outlook: Lefthanded Haggerty is the leader of the formidable offense after scoring 38 goals last season. The attack could be explosive again. Outlook: The midfield unit is expected to be a strength. 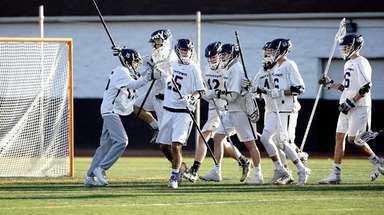 Outlook: The defending Long Island Class C champions have some question marks, Greaney said, including who will emerge as goalie and who will take faceoffs. Boehm (18 goals, 11 assists) will be relied on as the quarterback of the offense. Outlook: The team made the playoffs for the first time since the program was established four years ago, Amato said. With five returning seniors. this could be the Tuckers' season. Outlook: Zito (27 goals, 20 assists) and Maxwell (19 goals) were the team's leading scorers. Goal is to make the playoffs for the first time. Outlook: The varsity program returns after two years of having only a JV team. With a young group, the goal is to be .500. Outlook: The new program looks forward to competing. Sean Grismir A S r.
Outlook: The team is still young so another rebuilding year could be in the works.